Native to Africa, Asia, and Europe, and the Indian subcontinent. Introduced and naturalized in North America. Streambanks, river banks, pastures, field edges, roadsides, disturbed areas. 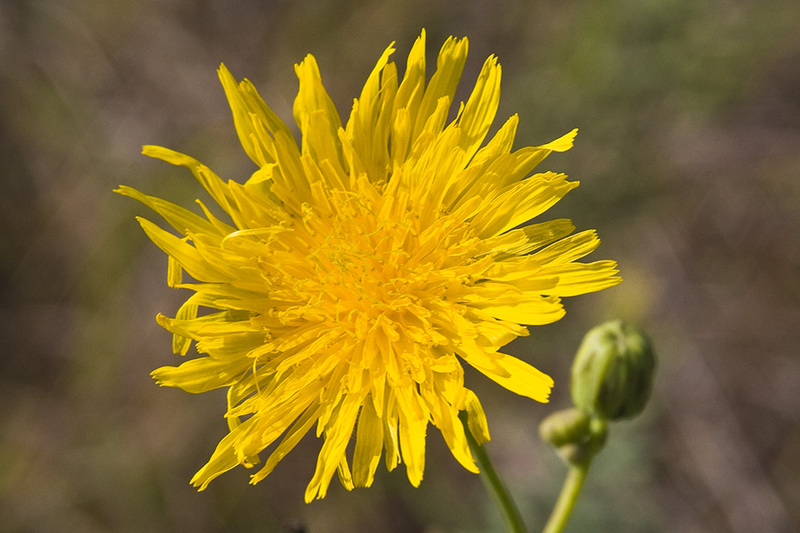 This is a 4″ to 60″ tall, erect, perennial forb that rises on one or more stems from a taproot. 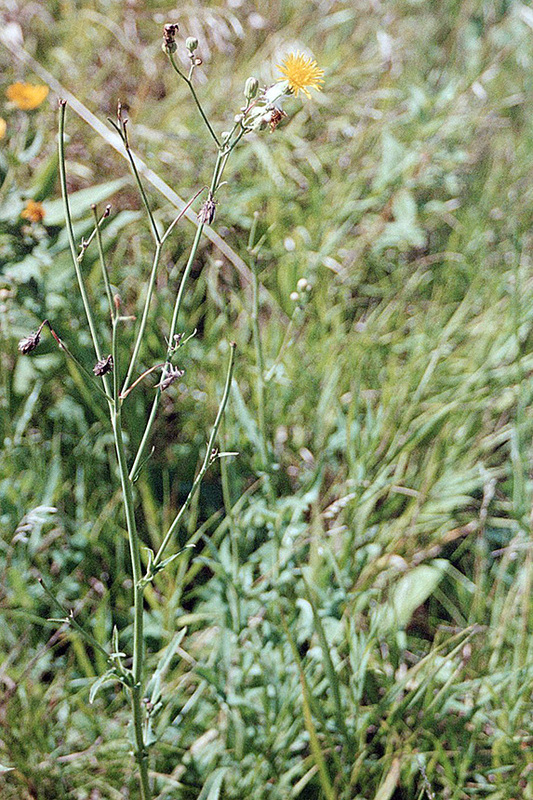 The stems are erect, hollow between the nodes, hairless, and often somewhat covered with a whitish, waxy bloom (glaucous). They occasionally branch near the top. The base of the stem is soft, not woody. When broken the stems exude a milky sap. Middle stem leaves are alternate, inversely egg-shaped to lance-shaped, 2⅜″ to 11¾″ long, and ⅜″ to 6″ wide. They are irregularly, deeply lobed (pinnatifid) with 2 to 5 more or less triangular lobes per side. At the base of the leaf blade is a pair of ear-like projections (auricles) that often wrap around more than half of the stem. The auricles are always rounded. The upper surface of the leaf blade is hairless and shiny. The lower surface paler, hairless, and sometimes somewhat glaucous. 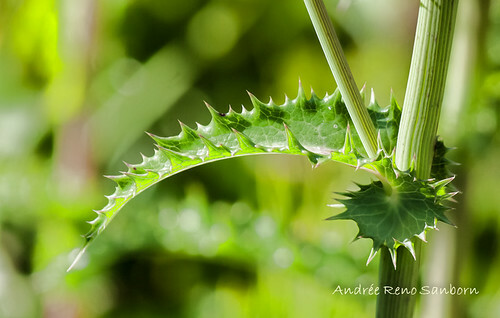 The margins have sharp, spreading teeth with prickles at the tip. Basal and lower stem leaves are similar and are on winged leaf stalks. Upper leaves become gradually smaller, less lobed or unlobed, and have more prominent auricles. The inflorescence is a loose, corymb-like cluster of several flower heads at the end of the stem. 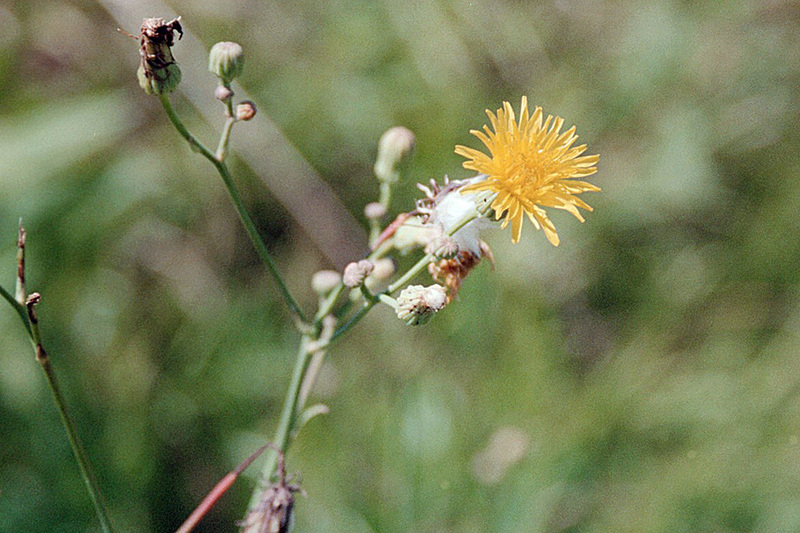 The stalks of the inflorescence are usually hairless, occasionally sparsely covered with reddish-brown, spreading, glandular hairs. The flower heads are ⅝″ to 1″ in diameter when fully open. The whorl of bracts at the base of the flower head (involucre) is ⅜″ to ½″ long and either contracted at the tip (bell-shaped) or not contracted at the tip (pitcher-shaped). The bracts of the involucre are hairless. Each flower head has 80 to 250 yellow ray florets and no disk florets. The ray florets are 5 ⁄16″ to ⅝″ long and have 5 small teeth at the tip. The flat, spreading, strap-like portion at the end of the ray floret is shorter than the tube portion at the base. The fruit is a ⅛″ long achene with usually 3 prominent ribs on each face (6 total) and a smooth, not wrinkled, surface. There is a tuft of microscopically barbed hairs at the tip. 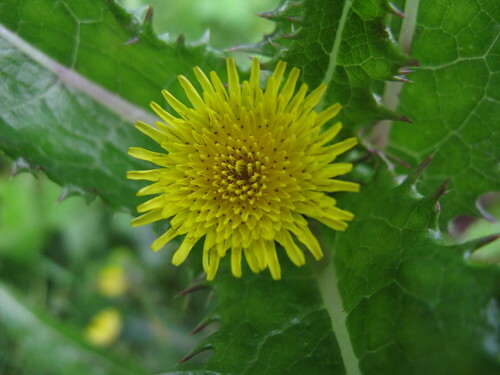 Common sow thistle (Sonchus oleraceus) leaf auricles are triangular to lance-shaped, usually sharply pointed, rarely rounded, and wrap around no more than half of the stem. The upper surface of the leaf blade is not shiny. The achene is wrinkled and 3 or 5 ribbed. 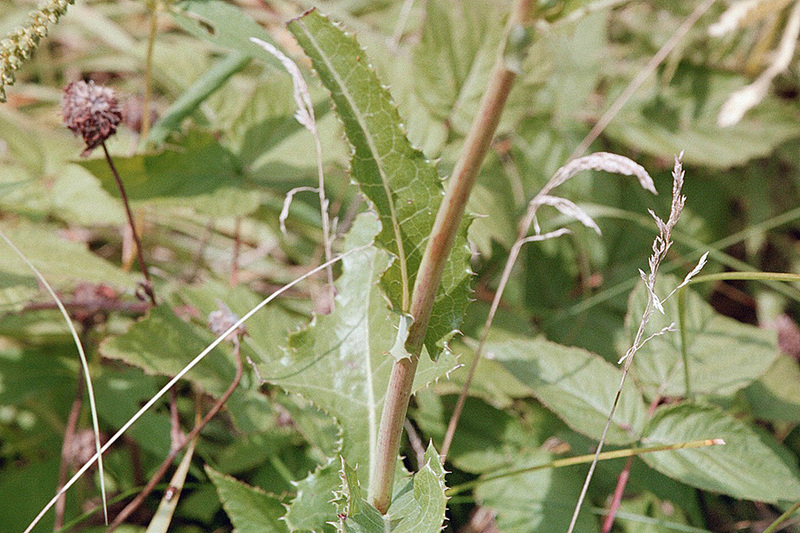 Field sow thistle (Sonchus arvensis) stem is hard and sometimes woody at the base. The leaf auricles may be rounded or pointed, and wrap around no more than half of the stem. The upper surface of the leaf blade is dull or only slightly shiny. 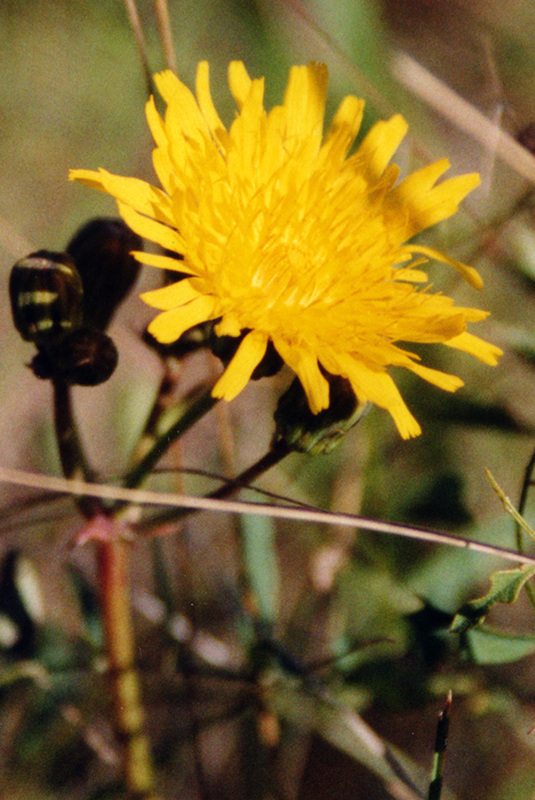 The flower heads are larger, 1″ to 1¾″ in diameter. The involucre is longer, 9 ⁄16″ to ⅞″ long. The ray florets are longer, ⅜″ to 1″ long. The achene is prominently 5 to 8 ribbed and is wrinkled. 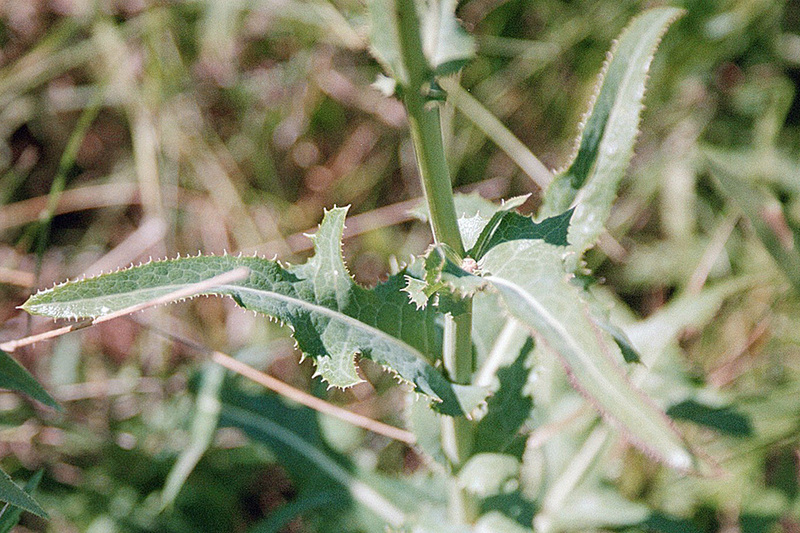 Prickly lettuce (Lactuca serriola) leaves have a row of prickles along the midvein on the underside. Thistle (Cirsium spp., Carduus spp.) 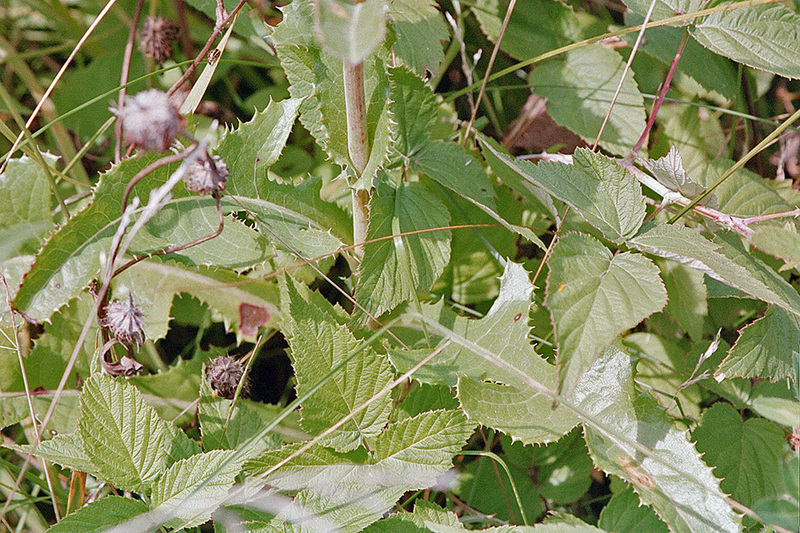 stems and leaves do not have milky sap. Uncle Steve has been watching this young tender but nasty weed/wildflower blooming here in Randolph County, North Carolina. 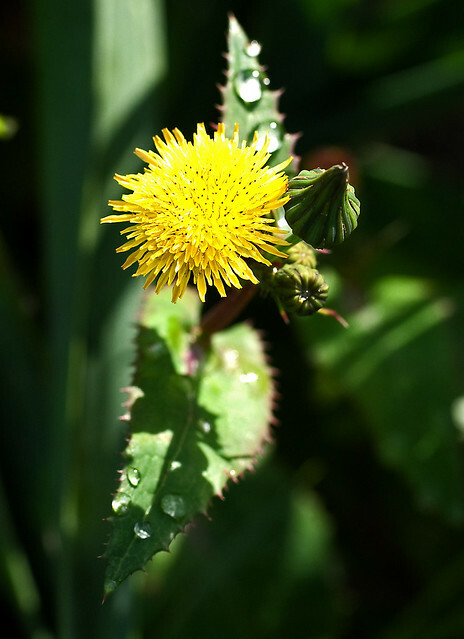 Sonchus asper (Sharp-fringed Sow Thistle, Prickly Sow Thistle, Spiny Sow Thistle, or Spiny-leaved Sow Thistle) is an annual plant with spiny leaves and yellow flowers resembling those of the dandelion. De Gekroesde melkdistel of Ruwe melkdistel (Sonchus asper) is een kruidachtige, eenjarige plant uit de composietenfamilie (Compositae oftewel Asteraceae). 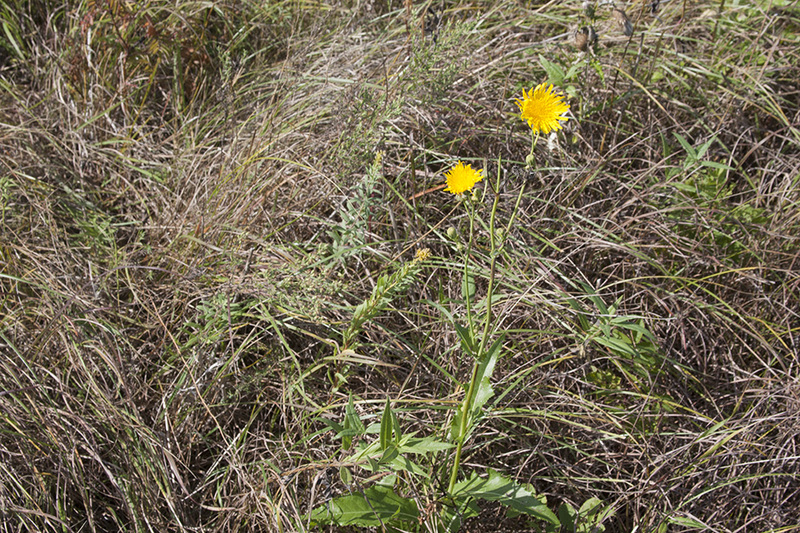 Prickly Sow-Thistle - Annual or Biennial plant up to a meter tall. Alternate leaves without stalks seem to wrap around the stems. Clusters of yellow ray flowers. Milky latex oozes from broken stems. 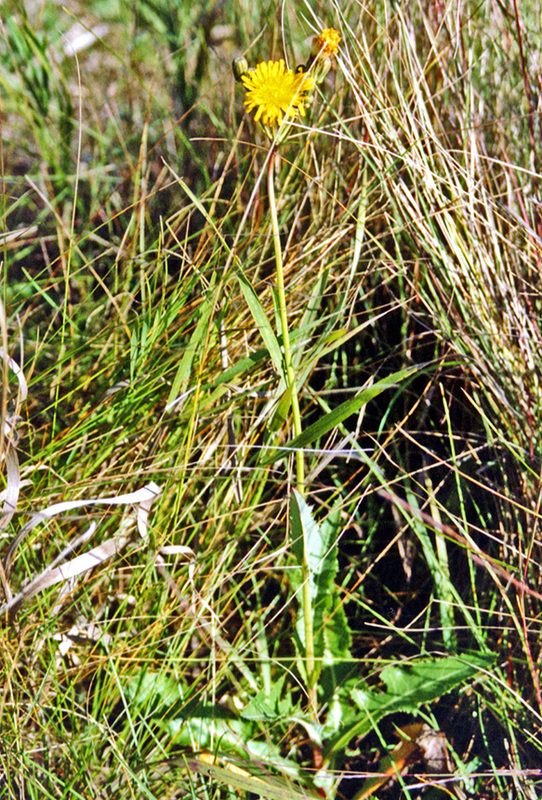 Widespread introduced plant from Europe. 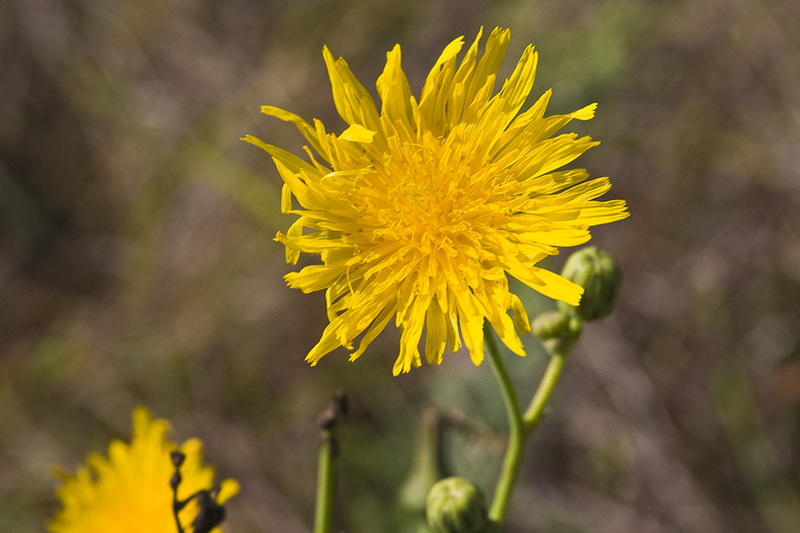 "Survival Doc" finds Spiny-Leaved Sow Thistle (Sonchus asper) in his front yard and discusses how to identify wild plants that can be used as an emergency survival food or herbal medicine. Northwest Arkansas, while walking along Sugar Creek I happened upon this beautiful (of course there are many who would not call a thistle beautiful...but I think it is) prickly sow thistle. While I was shooting this video, a bird from somewhere in the forest which lined both sides of the creek began a serenade. The bird you hear in the background has been identified for me as a White Eyed Verio.